After getting off to a rocky start with an engine failure during launch Sunday, a commercial cargo capsule loaded with a half-ton of equipment and supplies, including ice cream, carried out a flawless final approach to the International Space Station early Wednesday, pulling up to within 60 feet so Japanese astronaut Akihiko Hoshide, operating the lab's robot arm, could pluck it out of open space for berthing. Making the first of at least 12 cargo deliveries under a $1.6 billion contract with NASA, the SpaceX Dragon capsule, after a successful test flight last May, is the first commercially developed spacecraft to visit the station, the centerpiece of a push to restore U.S. resupply capability in the wake of the space shuttle's retirement last year. 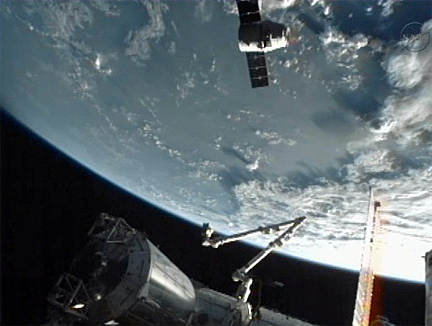 Hoshide used station's robot arm to latch onto a grapple fixture on the side of the Dragon capsule at 6:56 a.m. EDT (GMT-4) as the two spacecraft sailed 250 miles above the Pacific Ocean west of Baja California. "Houston, station on (channel) two, capture complete," Expedition 33 commander Sunita Williams radioed. "Looks like we've tamed the dragon. We're happy she's on board with us. Thanks to everybody at SpaceX and NASA for bringing her here to us. And the ice cream." Williams and Hoshide then maneuvered the Dragon capsule to the Earth-facing port of the forward Harmony module and locked it in place at 9:03 a.m., completing the rendezvous and berthing. "The control center team here and the team out at Hawthorne (Calif.) at SpaceX just did a phenomenal job of making a pretty complex ballet in space look pretty easy," said Bill Gerstenmaier, NASA's director of space operations. "And it was not easy by any stretch of the imagination. 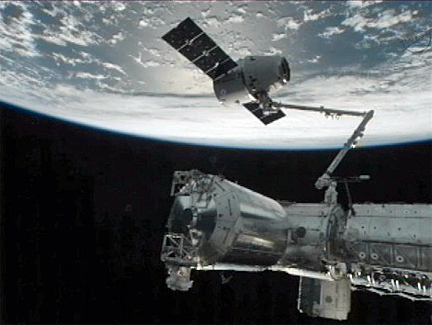 But they just did a great job, and it's great to have the Dragon spacecraft on board the space station." The long-awaited commercial cargo mission began with a spectacular launch Sunday night from the Cape Canaveral Air Force Station in Florida. But during the climb to space, one of the Falcon 9 booster's nine first-stage engines malfunctioned and shut down, forcing the flight computer to fire the other engines longer than planned to compensate for the shortfall. The Dragon capsule ended up in a useable orbit, but the engine failure prevented the Falcon 9 second stage from boosting a small secondary payload, an Orbcomm data relay satellite, into its planned orbit. As it was, SpaceX flight controllers had to quickly revise the Dragon rendezvous sequence to keep the craft on course and to conserve propellant. All of that went off without a hitch and the spacecraft moved into position for grapple right on schedule. The capsule will remain attached to the space station for the next three weeks while the lab crew unloads science gear, spare parts and crew supplies, including ice cream packed in a science freezer as a special treat for the three-person crew. The capsule will be re-packed with no-longer-needed hardware, failed components and experiment samples for return to Earth around Oct. 28. Unlike Russian, European and Japanese cargo craft that routinely visit the station, the Dragon capsule was designed to make round trips to and from the lab complex, giving it the ability to bring major components and experiment samples back to Earth for the first time since shuttles stopped flying last year. "This is tremendously important," said Gerstenmaier. "When we retired the shuttle, we needed a way to get scientific investigations, as well as necessary supplies, crew equipment, food, other things, to and from space station. ... Now, this is the first commercial flight where we're buying essentially services to carry up things to orbit." And to bring them back. "We have three minus 85-degree freezers on board space station," Gerstenmaier said. "We've not returned anything from those freezers since the shuttles quit flying last year, so they're stocked full of really precious blood samples from the crew, there's also biological samples in there, there's also some plant samples. "These are unbelievably unique and precious specimens. Locked in these frozen samples (is) potentially information that can reveal a lot about what microgravity is and how it works in a biological sense. ... We're going to take approximately one-third of the samples that have been stored in those freezers on orbit and return them here to Earth." The NASA contract with SpaceX requires the company to deliver 44,000 pounds of equipment and supplies over 12 flights. To pave the way for operational resupply missions, SpaceX carried out two successful test flights, one that tested the capsule's systems in a solo flight and another that included a berthing at the station last May. The Dragon capsule measures 14.4 feet tall and 12 feet wide, with trunk section that extends another 9.2 feet below the capsule's heat shield that houses two solar arrays and an unpressurized cargo bay. The spacecraft can carry up to 7,297 pounds of cargo split between the pressurized and unpressurized sections.